As a crocheter, it is my duty to crochet as much as I can and start as many projects as I can without finishing the ones I was working on. That's how I role. That's just the kind of crocheter I am. You might be reading this and thinking, nope, not me, LIAR! All it takes sometimes, is a little look on Pinterest, to make you forget all about what you were working on! Yes, Pinterest is a dangerous place to be for a crocheter. If you don't have any self control, you'll never finish a project in your life! Now, in my case, things aren't that bad. I still manage to pop out some actual finished items from time to time! Which is what I did yesterday! I was walking through the city with our little Pops (I call Poppy: Pops from time to time, I'm that kind of a dog owner) on the lookout for some nice props for all the photos we take of our work. My mind was set on a faux fur sheepskin rug or something like that. You know how whenever you need something, and you think you've seen it in every shop, they don't sell it anywhere?! Well, it was one of those days. After many many shops, I ended up in Woolworth (what? yes that still exists in Germany!) and actually found what I was looking for. But I found something else as well. They have quite a "crappy" (excuse my language) yarn section. Some acrylics in colors that just don't look right, some novelty yarn that just won't look good in any project, and then some cotton. Some dirt cheap cotton. Some cotton so cheap, that it was like they were giving it away. Packs of 4 (!) balls of 50 grams of pure cotton. For 2,99 Euros. That's what I normally pay for 1 ball! I couldn't believe it! But did I really need packs of cotton? 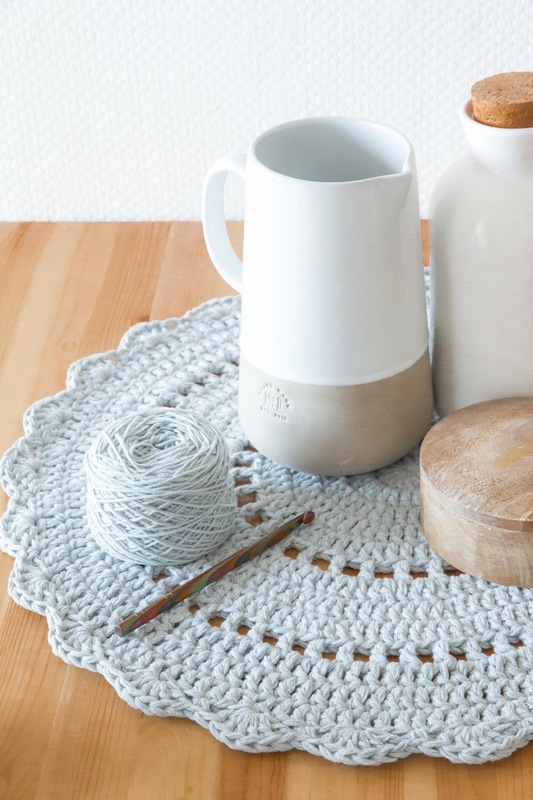 As a crocheter, the answer is always YES. You need it. And if you think you don't need it, you'll go on Pinterest and find at least 3489 reasons why you need it. You can even do this in the store on your phone, as to not waste time buying it! So I bought 2 packs. 8 balls of light grey cotton. And I knew exactly what it was going to turn into. 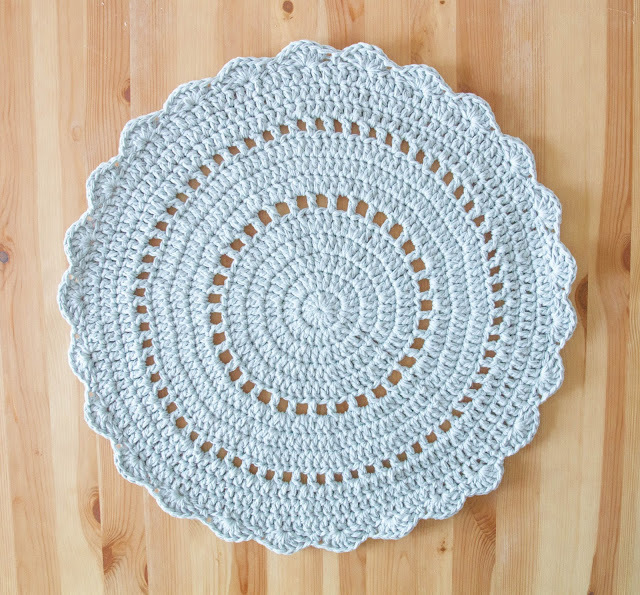 A chunky doily for our kitchen table! I figured I'd use 3 strands of the cotton held together, in combination with an 8mm hook to create a gorgeous piece of crochet! Cotton can be a little splitty to work with, but it's all about the kind of hook you're using! If you're hook is pointy in any way, don't use it! There's hooks that are pointy on both the top, and on the actual hook part. They are the worst for cotton (and for many yarns actually). I happened to have one that was very rounded off, and it went into the stitches without any effort! 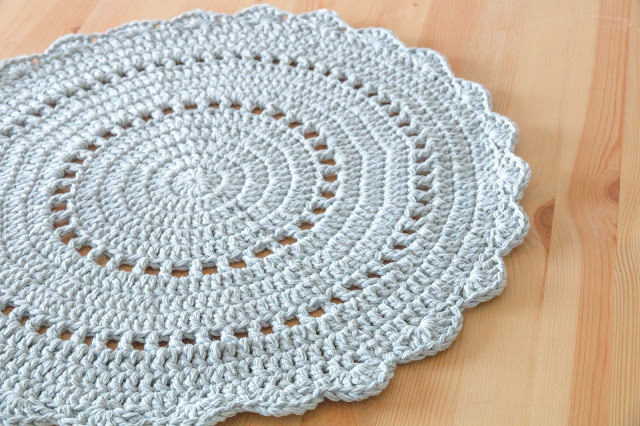 I ended up make a basic circle using double crochet stitches (14) and increased accordingly! I took my inspiration from different Pinterest pictures, and whipped this up without a pattern! I'm sure there's many patterns out there though for something very similar! If you have any questions, just let me know. So to come back to my question earlier on: did I need this yarn? Well, I can say now: I sure did! 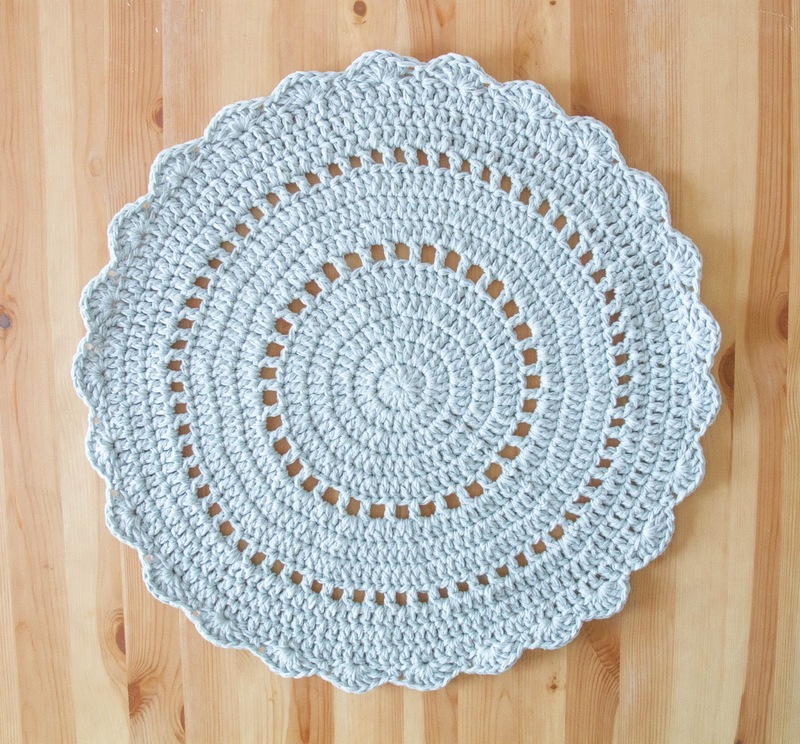 It took me a little less than 2 episodes of The Walking Dead to make this doily! I paid 6 euros, I have a beautiful doily and even have 2 balls of cotton left! What a deal. Have you guys ever made chunky doilies? 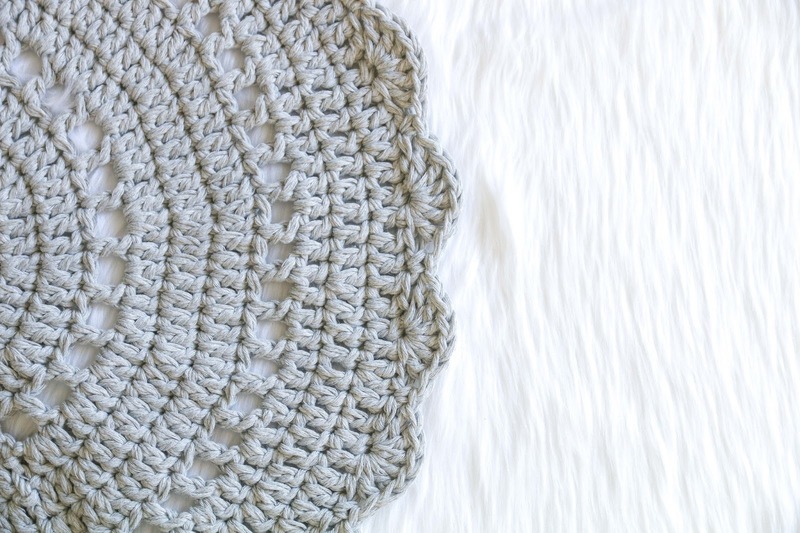 They are so much fun to make, and quite a statement in your home! I love your doily! I have a beautiful vase from Laura Ashley (picked up in a charity shop for pennies) and this would be the perfect way to show it off - thank you! 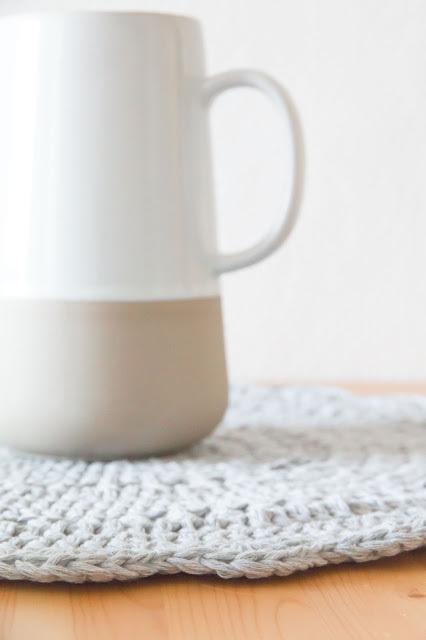 - I go to Pinterest every time I can't think what to make next, very addictive though - I once searched "home decor DIY" and was on there for a whole night!